Having does his best to sing in Les Mis and receive a lot of criticism for it, Russell Crowe can definitely be commended for his confidence in taking challenging roles. Far from relaxing a bit, his newest challenge comes in the shape of Noah, a role that could easily lead to a lot more ridicule and definitely isn’t easy. His bravery is rewarded though to some extent, and his performance together with the sheer spectacle director Darren Aronofsky has brought to the screen here carries a silly, overlong and endearingly daring film just about over the line. Indeed, if one were taken with the desire to make fun of Aronofksy’s labour of love and a project he says he’s wanted to do ever since he was eleven, it would be easy. His depiction of the fallen angels as large, stone creatures gives them a comical Entish and even Transformersesque quality that is hard to shake, particularly when their comical faces are taken in to account. Indeed, ‘The Lord of the Rings’ seems to have played quite a part in the look of this film, since all the landscapes have that sense of barrenness that so often is associated with Mordor, and one would not be surprised if Sauron were suddenly to appear with a nice shiny ring that he’d quite like to lose for a while. This sort of over the top ridiculousness is something that has to be forgiven for a film that wants to be as epic as it can be and truly capture the scale of the apocalypse it’s trying to depict, and to its credit it does a good job of making that an enjoyable watch. Aronofksy and cinematographer Matthew Libatique do concoct some stunning camerawork and every snarl and grunt of Noah’s certainly does feel more weighty when all hell is breaking loose around him and his beleaguered family. It’s the setting and the feeling of impending doom as much as anything else that carries the bite in all of the conversations which is a testament to how well managed it is. 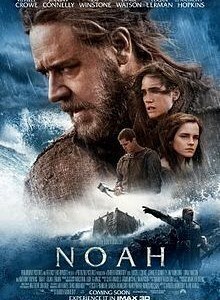 Indeed, the fervour created by the disaster together with the increasing tension about the extent and morality of Noah’s task soon become the best parts of the film, and this is where the actors really come in to play. Crowe is definitely ably aided by the likes of Ray Winstone and Jennifer Connelly, who do great jobs of questioning the extent of Noah’s task, and refusing to believe, in their different ways, that the Creator so ambiguously alluded to really desires for every human to perish. These conundrums are definitely tough ones to ponder and leave us and many of the characters in the film unsure as to whether Noah’s steadfast loyalty is genuinely the right way to go or whether Winstone’s Tubal-Cain has the right of it with his goal of preserving the human race. This is where all the grunting and growling stops being ridiculous and starts finally saying something, even if it is only for a while. Yes, ‘Noah’ is overly long, lingering far past what it should in both the first and final acts and it descends in to downright farce too regularly to be taken seriously throughout, but it’s bolstered by strong performances and a singular vision by a director who is, above all else, supremely talented. It will definitely not be his strongest work, but it is an admirable attempt at adapting a story that was always going to be difficult to adapt. For that, we will allow Noah to grimace, growl and gurn as much as he likes as long as there are no rousing renditions of musical songs to accompany it. You’re done with that now Russell.